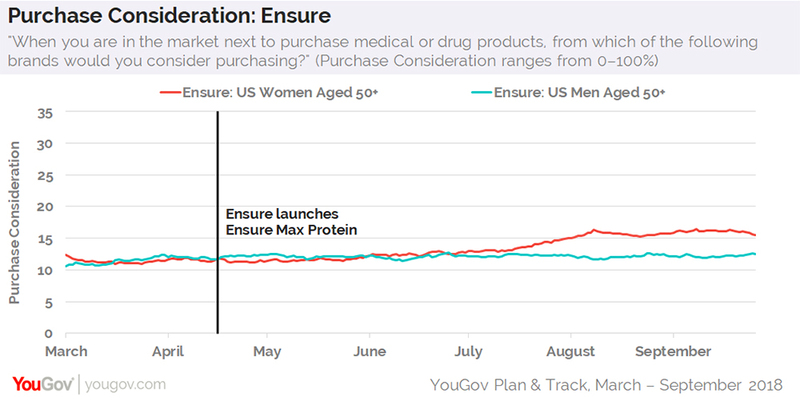 To help promote Ensure Max Protein, which comes in Milk Chocolate and Café Mocha flavors, the company partnered with actor Kate Walsh, perhaps best known for her role as Dr. Addison Montgomery on the ABC series Grey's Anatomy. On Instagram, for example, Walsh, who’s about to turn 51, has described the benefits of consuming the nutritional shake to her 1.8 million followers. According to additional data from YouGov Plan & Track, 44% of women aged 50+ have a positive opinion of Grey's Anatomy, compared to just 26% of their male counterparts.